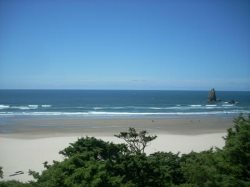 You may use the online booking function to make your reservation or give us a call at the Cannon Beach Vacation Rental Office at (503) 436-0940 if you have questions. Walk into the warm embrace of this family home and let the flood of memories made here take you to a happy place! Lois’s Family Sandbox has hosted generations of family gatherings and is eager to share with you, too. A classic beach house vibe awaits your family and friends from it’s perch above the beach at the south end of Cannon Beach. The kid-safe and family friendly neighborhood takes you back to the ‘When I was a kid..’ days as you turn them loose to explore. With the original knotty pine paneling and custom built-ins, there’s no mistaking the feeling of belonging, whether it’s your first time here, or if you’ve been coming here for years. Uniquely “Cannon Beach’, the stacks of board games, videos, and complete collection of Sand Castle Contest poster art give you a sense of place. Open wide the windows to let in the sound of the waves and the smell of the salty sea air, for the complete experience. You’re just a block to the beach and the high bank offers you views of the Pacific through the neighborhood. When you head to the beach, you’ll descend one flight of steps from the road. Turn left at the bottom of the stairs for a walk to “Lion Rock” and Hug Point, and enjoy an expanse of beach you’ll likely have almost all to yourself. Or, turn right and head toward Cannon Beach for coffee and a pastry while the kids and/or dogs entertain themselves with a run on the beach. A generous living area is ready for movies or games on the flat screen TV or hanging out to visit while dinner’s getting ready in the complete kitchen. Light up a blaze in the fireplace, and you’ve got a recipe for coziness that can’t be matched! Two queen beds and a pair of twin Murphy beds for the kids give you room to sleep six, and a bath and a half mean no lines in the mornings. The bedrooms are set well back from the living area, making mixed bedtime schedules easy to handle for a perfect multi-generational vacation. If you’d like a little outdoor living, the partially fenced yard or covered car port offer spots for grilling or sunning yourself on those beautiful Oregon days. It’s easy to make yourself at home at the Sandbox! Since this was formerly Lois’s home, expect to find everything you need for a quiet and comfortable family vacation at the beach. Come make some memories of your own at Lois's Family Sandbox!